Catvantage®There's a new cat tree from DesignWerks Inc., called the CatVantage, that will fit anywhere in your home and may even blend with your decor. Sans cat or cat atop, this floor to ceiling spiral, might even be mistaken for a sculpture. CatVantage is a functional sculpture, one that your cats can climb, perch, and cat-nap upon. The carpeted stairs and lofts can be placed clockwise or counter-clockwise and be placed anywhere along the frame. CatVantage is expandable from 7'7" to 8'5", and extra spacers can be added to extend to a 10' ceiling. 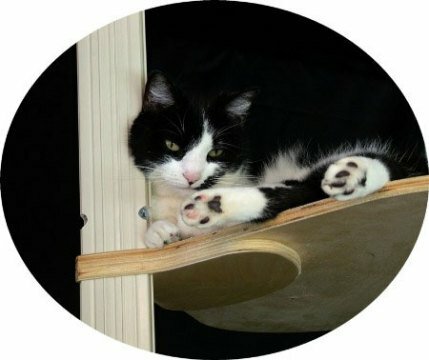 Cat perches can be placed almost to the ceiling on the CatVantage, giving kitty his best advantage over you. Maybe he'll stay off the refrigerator now. CatVantage is easy to set up. DesignWerks is already making more modules, scratching surfaces, taller frames, and wood frames for maximum flexibility for CatVantage customers. CatVantage is modern, modular, space consious, portable, and made from recycled materials. It will provide your cat with hours of climbing, scratching, and napping, not to mention all those vantage points. CatVantage starts at $195.95 for the pvc model. Visit the CatVantage website for more information.